Walsall boss Sean O'Driscoll will take his League One high-fliers to his old club Doncaster Rovers on Tuesday, having been given the firmest possible backing for his side's promotion hopes. The 58-year-old knows what it takes to succeed, having taken Doncaster up to the Championship in 2008. One of the keys this time round was to resist any approaches, if there were any, in the January transfer window. And hanging on to the likes of Tom Bradshaw and Rico Henry is a huge plus. Such was the surfeit of rumours about the future of 14-goal top scorer Bradshaw in particular that Walsall even felt compelled to put out a deadline-day statement. "In light of recent media speculation," it read, "the club wish to place on record that reports claiming a bid for Tom Bradshaw has been accepted are categorically untrue. "The player remains an important part of Sean O'Driscoll's squad and is key to our promotion push." Bradshaw, still had 12 months remaining on his previous contract with the Saddlers when he signed an extended two-year deal at the League One club last summer to run until the end of the 2016-17 season. Walsall have already seen their previous manager, Dean Smith, snapped up by Brentford this season, but the fact that his replacement O'Driscoll has his squad intact will further enforce belief at Bescot that they can now go and reach the Championship themselves. 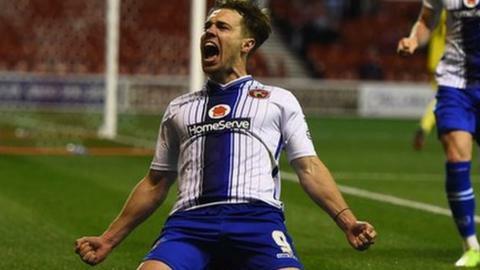 "Deadline day wasn't about what Walsall did, but what they didn't do. Saddlers boss Sean O'Driscoll re-stated only on Friday that they were not seeking to sell any of their senior players, despite seemingly endless speculation that they would part with any or all of Bradshaw, Romaine Sawyers and Rico Henry. "They were adamant all day that the most-coveted members of their squad, specifically top scorer Bradshaw, would not be sold. "Walsall's brief but strongly-worded statement followed a brief flurry of morning media reports that the club had agreed a transfer fee with Bristol City. But these reports appear to have been based on a parody Twitter account. "Walsall quickly asserted that he wasn't going, nor would he be. And he didn't. Their promotion challenge continues on Tuesday night at Doncaster, no doubt with renewed optimism among their supporters."